60 iCellTech Batteries, Size 13 Zinc Air Hearing Aid Batteries. (60 batteries Standard dial pack, 10 cards of 6 cells each). All product has arrived within 30 days directly from the factory and you won't find a fresher battery. Best if Used by Date of 2014. iCellTech zinc air batteries for hearing devices feature consistent great performance and guarantee high quality by thorough piece-by-piece inspections. iCellTech is the fastest growing zinc air battery brand in the world. iCellTech new generation hearing aid batteries passed most severe test specification within the new IEC test proposal. Its high technology will provide extra running time while maintaining higher operating voltage. 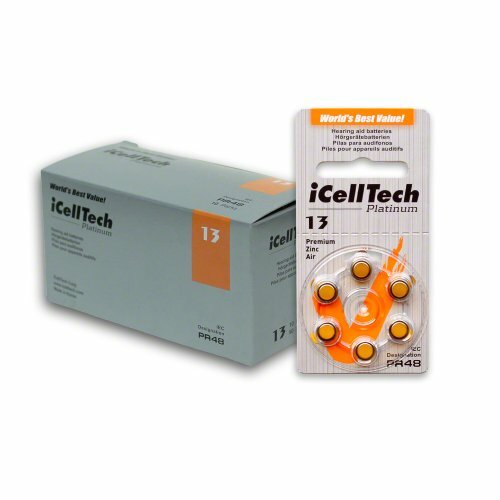 iCellTech new generation hearing aid Batteries are specially designed to have longer operational life time in high current drain applications. If you have any questions about this product by iCellTech, contact us by completing and submitting the form below. If you are looking for a specif part number, please include it with your message.